The former Edo State Governor said the APC has resolved to explore every legal means to ensure that the President of the Senate, Bukola Saraki, is impeached and replaced with a loyal party member. 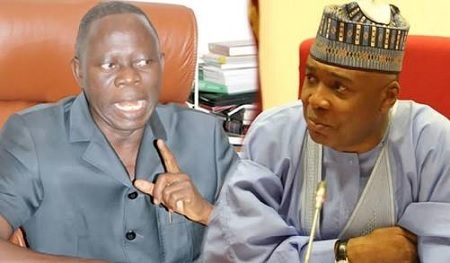 This was part of the decisions taken at a meeting between the National Chairman of the APC, Adams Oshiomhole, senators and members of the House of Representatives, in Abuja, on Tuesday. The National Chairman of the APC, Adams Oshiomhole, promised legislators loyal to the party that the APC under his leadership would reward loyalty noting that the party’s reward system would be one that would ensure that those who stood with the party in trying times did not regret it.